Back in December, the original Cowardly Lion costume worn by Bert Lehr in the 1939 movie production of the Wizard of Oz was auctioned off on Ebay by the Profiles in History auction house. It went for the amazing price of $805,000! A quote from the Profiles in History website states: "The Cowardly Lion costume worn by Bert Lahr composed of real lion pelts in the memorable "put 'em up, put 'em up" pose stands alone as the single most important film costume in the world! Discovered at the legendary 1970 MGM/David Weisz Auction, this Lion Costume is regarded as the most coveted piece of Hollywood history extant." According to the cbc.ca website, the costume sold for $705,00 US, but either figure is quite a steep price to pay, although worthy of this historic and nostalgic costume! A blue-and-white gingham dress worn by Garland in The Wizard Of Oz fetched £140,000 at an auction in London in 2005. The scarecrow outfit from the movie is on display in the Smithsonian's National Museum of American History in Washington D.C., while the tin man costume was unfortunately destroyed. I have personally seen one of the pairs of Dorothy's red slippers on display at MGM Studios in Orlando. 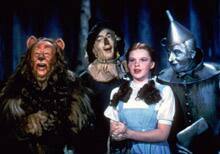 The Wizard of Oz movie is a world wide classic and one of my all time favorites. My earliest memories of the movie are watching it at my grandparents house one night while eating a snack of apples and nuts with my grandpa. I must have been only about 3 years old at the time as it predates my little brother. I am sure many of you have similar memories of classic movies shared with your families. If you would like your own piece of licensed movie history, we carry the costume and accessory replicas for a much more affordable price! See our Wizard of Oz costumes and accessories in child and adult sizes as well as deluxe adult styles. You can get your own badge of courage for only $5.95, chidlren's costumes start at $21.95 and adult costumes start at $41.95. I've been away for a while and I am anxious to get everyone out there caught up on all of the costume industry news. Check back for new and exciting updates on the newest and latest trends in the costume industry. It currently buying season for all of us retailers, so we are getting the first looks of what will be new and hot in costumes for 2007 and, of course, what will be tops for Halloween 2007. So, stay tuned for costumenews, costume trends, and updates from all of the buying shows.